If you love plants then you gotta see this! Sculptures made totally of living, growing plants. It’s called Mosaiculture. It’s the art of making sculptures from all living, growing plants. These exhibits tend to be on for a fairly long time so keeping the plants strong healthy and most importantly trimmed so that they don’t overgrow the sculpture is a full time job for a whole bunch of garden staff. 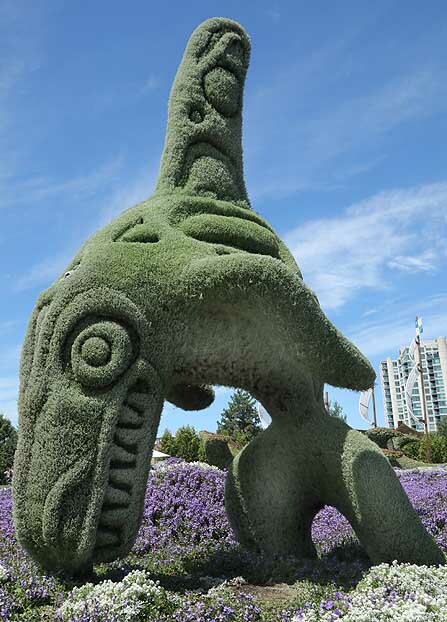 Mosaiculture is a very different from any other form of gardening or sculpture it combines the two. 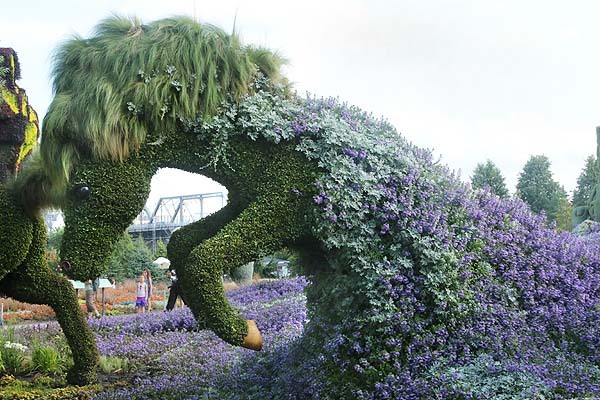 It’s not topiary which is forming sculptures and animals from living shrubs that are pretty much permanent. Mosaiculture is temporary for the most part and a corroboration of both sculptures, metalworkers and horticulture. First there is the design. This can be anything from a man on a horse to a giant woman’s face. Once the design is decided then the ironworkers determine how to create the structure, the build a steel framework welded together. For smaller sculptures this is all one piece. For the larger ones they are created in several pieces and a crane is used to move the heavy sections together at the exhibition site. They are then bolted together to form the whole sculpture. Once the structure had been created it is wrapped in water holding material usually a sphagnum moss mixed with soils and nutrients which are covered in a cloth that is stapled in place with very heavy staples. Some structures also contain complex irrigation systems within the sculptures to water and nurture the plants. However supplemental surface watering is also carried out especially in hot sunny weather. Once the structure has been completed the painstaking task of installing all the living plants begins. 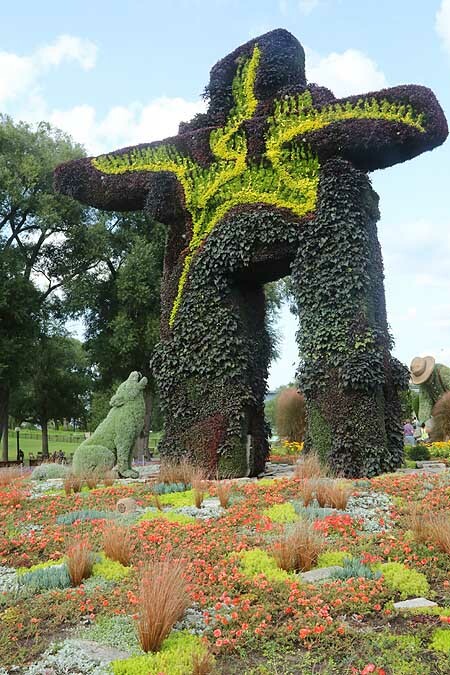 From trial and error over many years Mosaïcultures Internationales de Montréal (MIM) has determined the best plants to use. 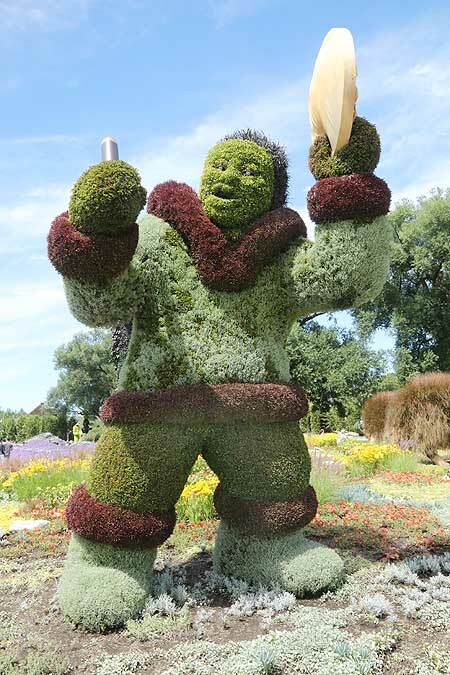 These are usually annuals that come in a variety of different colors but also grow well when kept short and can be easily trimmed and maintained to ensure that the sculptures always look their best. MIM is one of the only companies in the world that does this work so its not surprising that most of the exhibits tend to be in Canada. 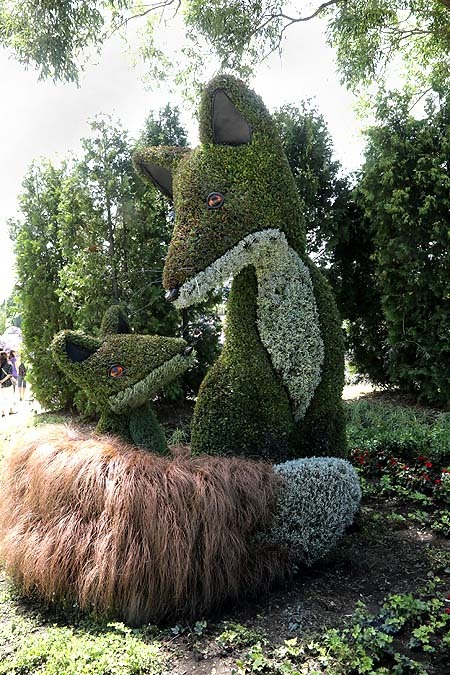 Fox and her kit mosaiculture. The use of grasses for the fluffy tail is delightful. 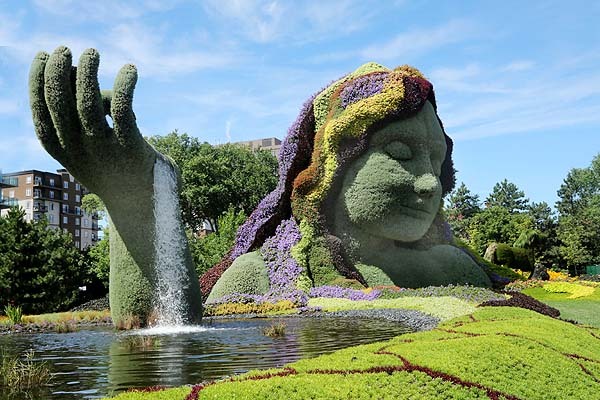 This year the Mosaiculture exhibit is in Ottawa Canada. Well, actually it’s in Gatineau which is right across the river from Ottawa. So if you want to visit and fly in then Ottawa is where you want to head for. This year is Canada’s 150th anniversary so to celebrate admission to the exhibit is free! Usually there is a charge to see such amazing sculptures so this years a really great deal. If you have never been to Ottawa then there is a treat in store too. It’s a totally enchanting city with masses of things going on and some majestic buildings and museums. This is our forth Mosaiculture exhibit and its always a joy to see. If you choose to go, please take the time to appreciate the wonderful work that has gone into these superb sculptures. Its not just the design of the actual sculpture its also all the plants that surround it. These plants create a scene. Lobster fisherman on sea. Note how well the plants have been used to create frothing waves. One of my favorites this year was the lobster fisherman. 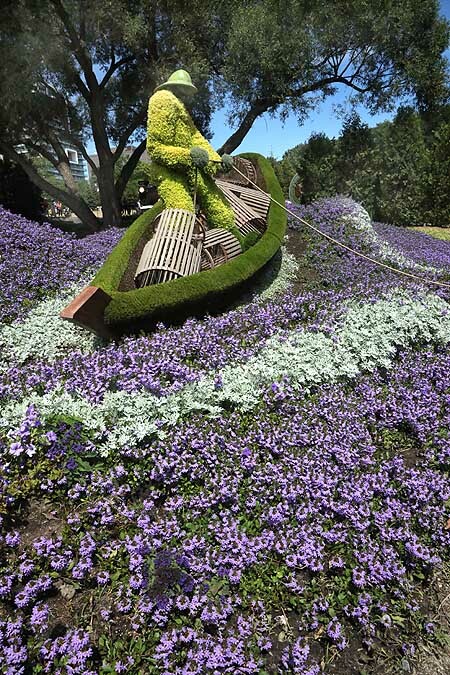 The detail that went into creating the boat and the fisherman and lovely but the sculpting of the earth to plant the Scaevola and blue petunias that mix with dusty miller to form waves on the sea. The whole concept makes the sculpture come alive and is truly delightful. 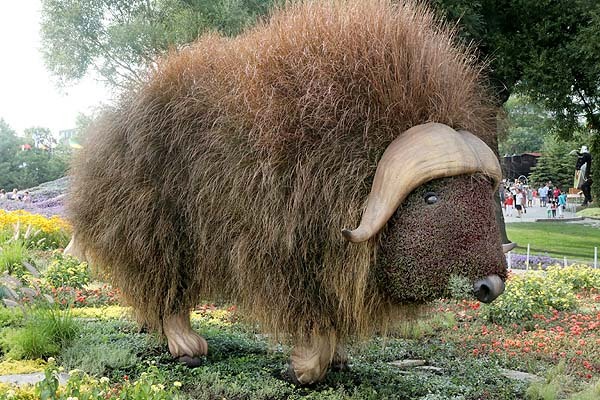 The delightful use of the long fluffy grasses to create the coat of the musk oxen makes the whole sculpture that much more delightful. Who doesn’t want to take this fluffy thing home with them? Another of my great favorites was the tundra scene dominated by a large inukshuk, (pronounced in-ook-shook) which is an Inuit (once called Eskimo) creation. These stone monuments are created by the Inuit to help guide them through their arctic wilderness. Here the inukshuk is depicted with a wolf howling up at the northern lights spread across the face of the inukshuk. The whole sculpture is lovely but is made even more so by the wonderful tundra that has been created for it to sit upon. Using red moss roses dusty miller, grasses and other plants to create a colorful landscape it gives the sculpture far more drama. I loved the tundra landscaping here almost as much as the sculpture itself. Wolf howling at the northern lights up the side of large inukshuk. The foreground tundra is superb and so colorful. The tundra area ranged over a larger area to encompass the musk oxen, polar bear (not pictured here) and the Indian drum dancer as well as the inukshuk. Like to ocean scene earlier in the walk encompassed several different sculptures such as the whale shark, puffins and ships discovering Canada with the horses bursting from the sea as the made their way to the shore. Horse bursting from the water having swam ashore from the boat that carried it to Canada. The dusty miller and Scaevola make stunning foaming ‘water’ cascading off the horses back. Of course there is always Gaia the mother earth goddess. This sculpture appears in some form in every Mosaiculture exhibit it’s the recurring theme and the most commonly depicted and shared. Its certainly impressive but on its fourth iteration I am far more impressed by other newer offerings. Gaia the mother goddess a recurring theme at Mosaiculture. Makes use of petunias and red and lime green potato vines to create her cascading hair. 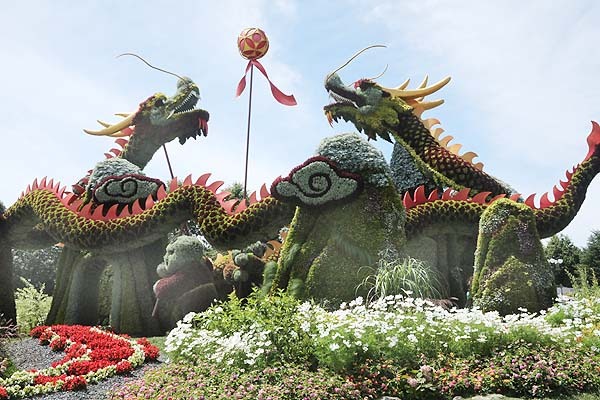 Mosaiculture is also beloved in China where many of the techniques originated and each time there is an exhibit the Chinese usually produce a sculpture. This year they produced two very complex and totally magnificent ones. The first from Beijing really needs to be studied to understand it. The first impression of course of the giant dragons that reach skyward rising high above the rest of the sculpture. Beneath are the dragon dancers holding the dragons aloft on long sticks just as in real life in dragon dancing. These dancers however are interwoven with small mountain peaks which depict the rocky mountains where a great many Chinese worked to create the railways that were so important to early America and Canada. This railway is depicted in red and white begonias emerging from a tunnel in one of the mountains on the left side of the picture. Pair of mosaiculture lions from Shanghai exhibit. Then there are the lions from Shanghai! Wow what a display! A massive complex Mosaiculture to rival anything I have every seen. The largest one at the exhibit it has nine Chinese lions in various poses on stylistic clouds, one dancing on a ball along with a Chinese circle with decorative swirls all fronted by lovely flower beds. This display is truly awe-inspiring. 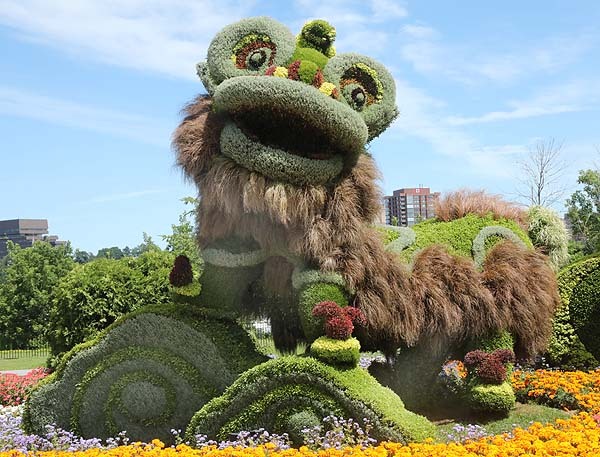 It uses far more plant variety that the other sculptures with the use for fluffy grasses to depict the lions fur and even the unseen underbellies of the lions have been planted with more shade loving annuals. The time taken to create this exquisite sculpture is mind boggling. While I really liked a lot of the other sculptures this was my favorite because of its size, complexity and delightful use of so many different plants to create such a wonderful sculpture, plus I really like Chinese lions. 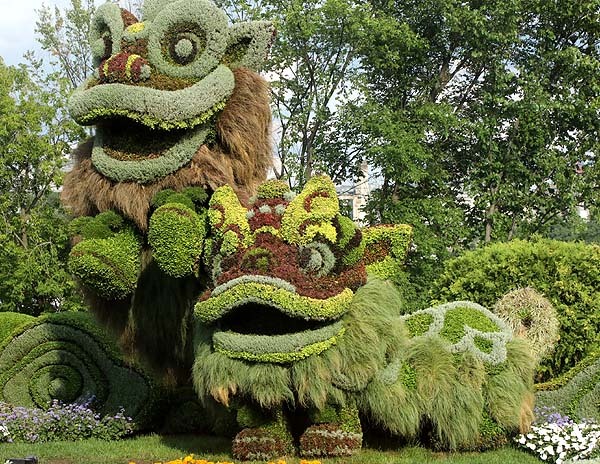 Large group of Chinese lions is massive mosaiculture display from Shanghai. This stunning sculpture is enhanced by marigolds and begonias in the foreground giving it even more color. 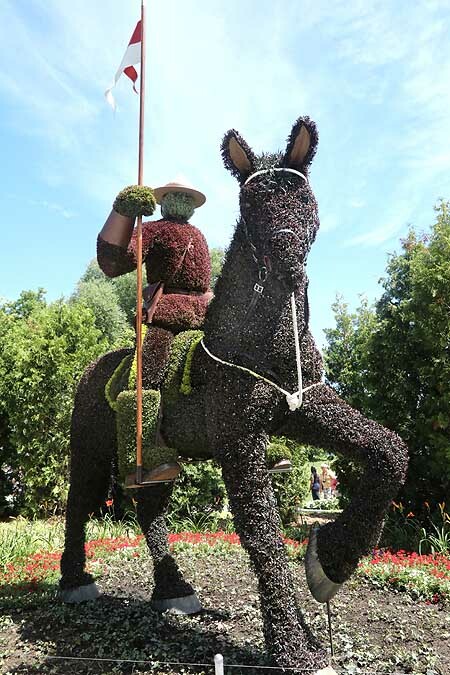 While not the most impressive Mosaiculture exhibit I have seen yet – that prize must go to Mosaïcultures Internationales Montréal 2013 at the Montreal Botanical Gardens. This exhibit was much larger and more impressive, plus the setting the botanical gardens offered much better backdrops to the sculptures where there is no distraction of high rise apartment buildings, hotels and bridges. The first mosaicultures were held at the Montreal waterfront with a backdrop of grain silos, but somehow this seemed better and more fitting that apartment blocks. However focus on the sculptures and the buildings don’t matter. 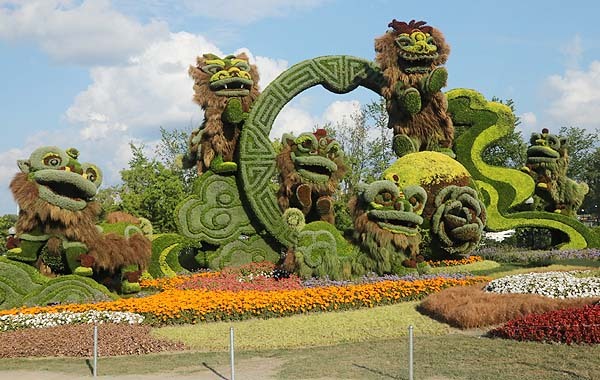 Sadly almost all the Mosaiculture exhibits tend to be in Canada, most often in Montreal. Others have been held in China (2006), Japan (2009) and Turkey (2016). The only exhibit in the U.S. was in Atlanta botanical gardens in 2013-14. Most commonly these exhibits seem to be held every 2-3 years so if you want to see one then head to Ottawa this year. Next time it may be a lot further away and less accessible. Only some of the exhibits are pictured here so go see the others for yourself. It’s really a site worth seeing and should not be missed. Author Janice Hazeldine PhDPosted on August 14, 2017 August 15, 2017 Categories festivals, happenings, out and about, plants, things to doTags exciting use of plants, living sculptures, Mosaiculture, Mosaiculture Canada, novel use of plants, plant sculptures, plant things to do, something you have to seeLeave a comment on If you love plants then you gotta see this!